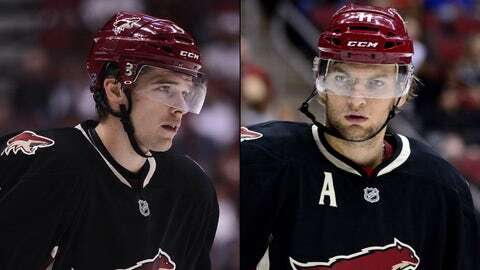 Zbynek Michalek (left) was picked for his second Olympic team by the Czech Republic, while Martin Hanzal will be making his Olympic debut. GLENDALE, Ariz. — The second wave of Olympic roster selections were announced on Monday. Another Phoenix Coyote was snubbed. Center Martin Hanzal and injured defenseman Zbynek Michalek made the Czech Republic’s roster, but right wing Radim Vrbata did not. "I’m surprised. I think he deserves to be on the team. His statistics speak for themselves the last couple of years," Michalek said of Vrbata. "Vrby is a great friend of mine, and I’d love for him to be there. Unfortunately, our coach has a different opinion. We’ll just have to wait and see if it was the right decision or not." Vrbata is tied for the Coyotes team-lead in points with 29 (11 goals) and is the fourth-leading Czech scorer in the NHL this season. Vrbata did not address reporters after Monday’s practice, but he was not the only surprising omission by Czech coach Alois Hadamczik. Flames forward Jiri Hudler (11 goals, 33 points) did not make it. Nor did Florida forward Tomas Fleischmann. On defense, St. Louis’ Roman Polak, Colorado’s Jan Hejda and Detroit’s Jakub Kindl were all left off the roster, while Extraliga blueliners Michal Barinka, Lukas Krajicek and former NHL player Tomas Kaberle made it. The biggest surprise of all? Petr Nedved made it. Nedved is 42 and in his seventh season in the Czech league. "It’s a different sport," he said. "It’s more skating, more circling." "It’s a big factor," Michalek said when asked how much the injury impacted his Olympic decision. "Right now, I’m not playing and havenât played for a while. My first thing is to get healthy and get playing. If everything goes well, then I can go and play the Olympics. "I really don’t know if we can get it to 100 percent right now during the season. I want to get it close to 100 percent, functional." The remaining Olympic rosters will be announced on Tuesday. 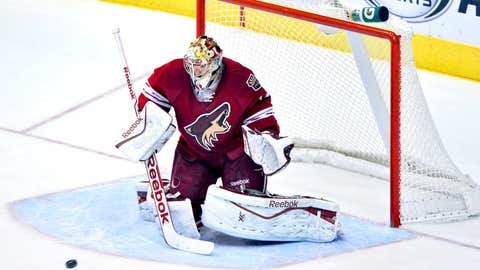 Coyotes goalie Mike Smith (Canada), defenseman Oliver Ekman-Larsson (Sweden) and forward Lauri Korpikoski (Finland) are candidates for their respective national teams. Ekman-Larsson did not practice with the team on Monday, and Tippett said he would not play Tuesday against the Calgary Flames. Tippett said Ekman-Larsson would take part in Tuesday morning’s skate and hopes to have him back in the lineup later this week. "We’d gone a couple without scoring, but we were still getting pretty good chances," Tippett said. "It’s concerning that the last little bit we haven’t gotten great chances."